"Super-Artista Incógnita's adventures in Algarve"
Andrea Inocêncio (1977) was born in Coimbra. Her artistic practice extends to photography, performance, drawing, set and costume design for theatre. Her pieces have a social and political approach through a critical but humorous dialogue. Her work is based in a continuous process of research and creation both collective and individual. In collective art projects collaborates with artists whose practices range from different disciplines. Through these encounters she search for enriching her practice as well as to explore trans-disciplinary art practice. She is also committed with communities’ collaboration art projects. Post-graduation in “The State of the World” at UNL & Calouste Gulbenkian Foundation (Lisbon, 2008); post-graduation in Cartoon and Illustration at IADE (Lisbon, 2002); master in Set and Architecture Production Design at Escuela Superior de Artes del Espectáculo TAI (Madrid, 2001) and degree in Painting at EUAC (Coimbra, 2000). Winner of the artistic projects competition of “Serralves em Festa” (Oporto, 2010); grant by the INOV-ART program of DGArtes (Barcelona, 2009); grant by the Internationalization Support program of the Camões Institute (Argentina, 2009); grant by the Eurodyssée program (Paris, 2008); grant of PAAD – Atlantic Digital Art Project (Gran Canaria Island, 2006) and grant for artistic creation by DRAC – Azorean Regional Direction of Culture (Azores Islands, 2005/06/09). Assistant Professor of Visual Arts at ESEC – Polytechnic Institute of Coimbra, between 2010 and 2012. Andrea Inocêncio was chosen by photogrpher Rodrigo Bruna. Laatikkomo’s interview with Andrea Inocêncio, September 5th, 2014. 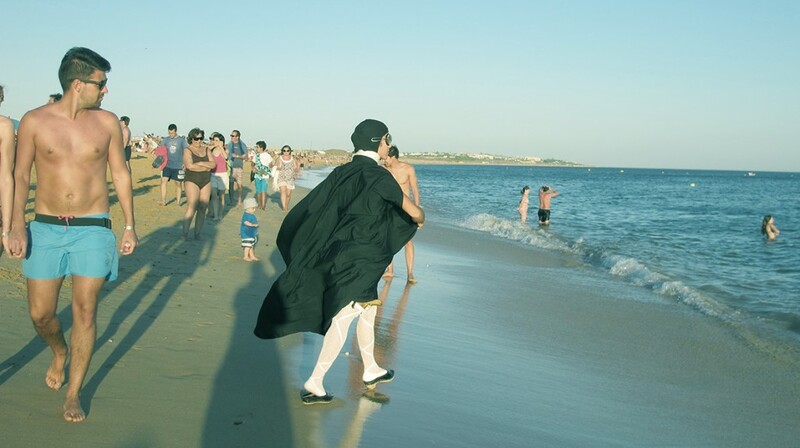 AI: I’m from Coimbra (Portugal), where the oldest European University stands with strong traditions. This particularity, in my opinion, raised a very conservative city with closed circles of people, culture and minds. On the other hand, alternative movements appeared opposing precisely that conservatism. In some way, I think that living simultaneously between constraint and revolution influenced my life and work. The Super-Artista Incógnita (Super-Unknown Artist) wears a university’s student cap and some props of folklore and fado (in Coimbra’s fado, only men are allowed to sing). AI: Since I remember being photographed. I hated having the camera pointed at me… Only by the age of 9 or 10 this feeling changed, when a photographer, my parent’s friend, showed me his camera and photo collection and started photographing his niece, me and my sister playing during his photographic journeys through nature. Later, when I was a teenager, I took my first black & white photography course and at the end of it, my godfathers offered me an old Zenit 12 xp which, besides thrilling, got me engaged with photography until now. I’ve also had the chance of living in a city that hosted a great event like the “Encontros de Fotografia” (Photography Encounters) between 1980 and 2001, the most important photographic event in Portugal. L: Although you use photography as one of the art forms in your work, your artistic practice includes more than just photographic techniques. Can photography be replaced with a different technique, or is this medium necessary for the execution of specific projects? AI: Depending on the project’s concept I chose the “appropriate tools” to develop it. So, in my work, photography is a medium required for the execution of specific projects. I consider myself an artist that explores several mediums and trans-disciplinarity, not much as a photographer per se. Nonetheless, photography is used in most of my projects, if not as a final product, then in the process of creation and investigation and many times pasted in sketchbooks. AI: I link photography with history, anthropology and science. Thus, I see it with a great importance to memory, preservation and investigation. In my work, photography is a very useful tool that can be used to register moments and situations as research, to document performances, to create new images, stories and worlds. L: In this particular series of images, it seems the public is surprised by your performance. What role does the public play in your work, other than giving you a stage – a context to perform? AI: In fact, public is a fundamental piece for the conceptual success of many of my works. In this particular project, it aims to reach as many people as possible, to wake up each one’s interior super-hero (ine) and childhood, break daily routines, surprise people and make them question. When the public is not present, I feel I’m just playing for the picture. L: Many of your photographs are working with similar visuals, portraits, string, costume. Do you see your photography over time as one evolving project? Do you see your work as one body of work, or are they in some way separate from each other? AI: Yes, sometimes one project leads to another and there are some characteristics that I maintain from project to project. I could say that this continuity is merely something that makes part of me as a whole. Nevertheless, I produce many different kind of photographs, depending on the subjacent concept I’m working on and because I wish to explore different methodologies. Especially if working with other artists, I like being contaminated by others idea’s and processes. L: Your work discusses, among other things, gender roles, and behaviours. Is the gender of the artist important to the artwork? And is it important to include the gender of an artist while discussing their work? L: Could you list 5(or more) words you were thinking about when you made this work? AI: I can list five and more: gender, identity, hybridism, stereotypes, constraints, migration, childhood, challenge, craziness, freedom, anti-power and fun!